1) Why do we so often phrase corrections as body-type-specific, even when they’re not? Both are basically asking you to move bigger, which could be a perfectly valid correction for anyone. Is reminding people of their height actually useful here? Same with “You need to really point your feet, because your ankles aren’t as flexible” versus “Your need to really point your feet to use all that ankle flexibility.” If the point is just “point your feet,” is it actually relevant to point out obvious physical features? I’m sure I’ve done this myself, maybe because it makes the correction feel more “personal” (without adding any actual personalized direction). But at a closer glance, it seems, well . . . pointless or even counterproductive to needlessly associate technique with body type. Sure some technical corrections are body type-specific, but if they’re not, why pretend they are? 2) Why do we assume that preschoolers can handle improv, but not middle-schoolers? We put preschoolers in “creative movement” classes, because they’re not developmentally “mature” enough for structured technique and choreography. By age 7, they’re supposed to be too old and for that. These “creative movement” exercises look suspiciously like improv classes, which usually show up in more advanced dance training–but not before high school or college, when the dancers are considered technically/artistically/intellectually/emotionally “mature” enough. And if they do have some improv experience before that, we assume that they must be an extra “mature” group of students. Why this improv gap? I understand that there are other important aspects of training to focus on during this intermediate period, and that every school has to make some choices when it comes to allocating time. But I have a hard time buying the “not mature enough” argument that gets thrown around a lot. Why do we trust 3-year-olds to decide how to move their bodies not 13-year-olds? Sure lots of middle-schoolers tend to be self-conscious about improvisation, but maybe that would be different if they never stopped doing it. Note: I don’t teach on a regular basis and I do mean these as questions, not just criticisms. So if you’re a teacher (or student) who sees a good reason for doing these things, I’d love to hear and discuss it. I’m just less inclined to hold onto teaching practices without a good why. A little fun . . . Universities describe themselves as great centers of knowledge. That may be true, but I would argue that they’re even greater centers of pretending-you-have-knowledge. I’m not the only one here who has ever felt compelled to pretend to know . . .
. . . among other things. With practice, you figure out how to pull together a (sometimes) convincing act of omniscience based on your vague impressions, social referencing, and cool head nodding, all while feeling as clueless as ever. Nah, just kidding. I’m pretty sure that Soc was just trying to humblebrag about his self-awareness here. Because he sure seems to act like he knows he knows a lot. What we actually should acknowledge, though, is that we don’t know everything. No one does. No matter who you are, you inevitably know more than average about some things, an average amount about some things, and embarrassingly little about some things. So why don’t we just stop pretending that we’re all experts on every subject and ask someone who actually knows? Let’s be real, there are people who will find it absolutely ridiculous that you don’t know what they consider to be “common knowledge.” Sometimes I find myself surprised by some people’s lack of basic knowledge about modern dance or feminism. But then I remember that they might be appalled by how little I know about basketball, Indian politics, or EDM. And more importantly, I answer the question anyway. Because here’s the thing about “common knowledge:” at some point, whether you remember or not, it was learned. And if something is really that important to know, it’s much more productive to be encouraging of someone currently learning it than to be angry that they didn’t learn it in the past. We might claim to detest ignorance, but pretend-knowledge-culture (yup, I just labeled yet another thing a “culture”) is just collective ignorance held in place with extra layer of pretentiousness. So it’s time to drop the act and ask the questions: we might not all seem so effortlessly cool, competent, and educated, but hey, we can actually start learning stuff. Being a boy in ballet can be rough. Like a lot boys with interests counter to expected gender roles, they can get targeted for being “girly” or “gay” (whether or not these things are true). But let’s also pay attention to how we’re responding to this type of bullying. The Real Man thing again? 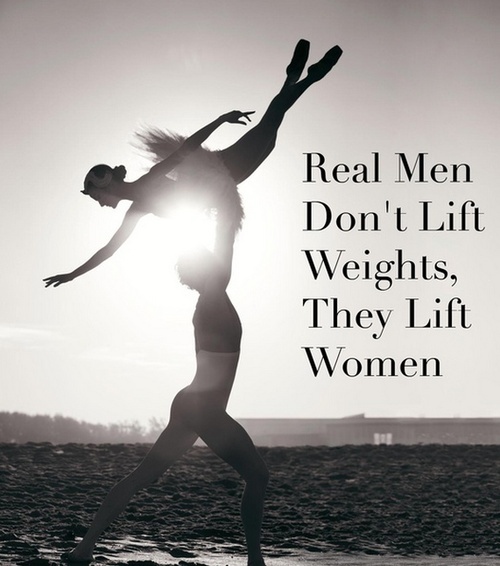 Eh, I know plenty of men who lift nothing and are still pretty real. One of my least favorite defenses of boys in ballet is the “no homo” defense (with a side of misogyny). Growing up, I heard a lot adults tell boys who do ballet to respond to “that’s gay” comments by replying that they spend their days surrounded by hot girls in tights that they get to touch. As one of the “girls in tights,” these statements always made me feel uncomfortable and objectified. I also like girls, but I certainly never came to ballet class to check people out. I would be pretty offended if someone suggested otherwise—so why should it be different for boys, who are also probably coming to class for the purpose of actually learning ballet? Because let’s be real, ballet is hard, and regardless of your gender or sexual orientation, you’re not gonna stick around long or get very far if you’re only there for the purpose of staring at butts. What does it say about our cultural values that staring at butts (as long as it’s hetero) is considered a more acceptable motivation for boys in ballet than practicing a challenging art form? Look, I want to erase the stigma associated with boys in ballet at least as much as anyone else–but we can’t do that simply by erasing gay boys in ballet and waving around flag of aggressive heterosexual masculinity. That only trivializes the commitment of male dancers, demeans female dancers, and devalues ballet itself. If really we want to end a stigma based in homophobia and gender-policing, we’re gonna have to actually fight homophobia and and gender-policing. Credit to Asher for inspiring this post! As I’ve been realizing lately, adult open ballet classes can do a lot to knock out feelings of illegitimacy. And not in the ways you might expect. You know that pesky impostor syndrome which is always reminding you that you don’t deserve to be where you are or doing what you’re doing? As if that there is some line that divides the legitimate from the illegitimate, and you can’t feel comfortable or confident with yourself until you cross it. What and where that line is can be shifting and uncertain: would perfect turnout make you legit? A spot in a conservatory? A company contract? Still, you remain convinced that this line exists and that the end to your insecurities, the point where it all gets better, lies somewhere above your head. Impostor syndrome definitely isn’t unique to dancers, but in such an uncertain profession, it can be particularly hard to shake. That’s where open classes come in. Open classes bring together a wide assortment of people ranging in age, background, ability, and relationship to dance. The class probably has a level specified (beginner, intermediate advanced), but that doesn’t stop people outside that range from showing up (this is particularly the case in smaller cities with fewer classes and therefore less stratification between professional and recreational classes). There are current professionals, tech employees who danced as kids, 70-year-olds who took up ballet at 65, teenage bunheads, 50-year-old retired principal dancers, college students, and oftentimes someone pregnant. There’s people with their legs by their ears and people with their legs barely off the floor. And what’s beautiful is seeing all these people not just dancing together, but also all working their butts off, struggling, and messing up at times. 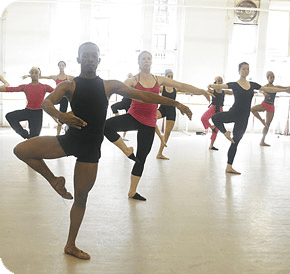 Not necessarily struggling with the same issues–one person might be figuring out how to squeeze out that fourth pirouette while another is working on a single–but nonetheless working through issues related to their respective points in their dance journeys with the same focus and energy. There’s something about seeing a gorgeous professional falling out of turns or a beginner standing in the center with unwavering presence that will crush your lingering impostor syndrome. Your weaknesses and and challenges don’t mean that you don’t belong there–they mean that you very much belong there and you can be comfortable and confident about your place in the struggle. Because no matter how good or bad you are, there is no line of legitimacy that will fix everything: the struggle never ends! And that’s a good thing, I promise. See, most popular depictions of ballet focus on the “obsession with perfection” aspect. But in reality, while perfectionistic ideals are a thing, dancers learn that actually being perfect is clearly not. So you have to get pretty comfortable with perpetual imperfection. That’s not always easy, but it can be pretty awesome if you approach it the right way. There’s a certain sense of liberation in knowing that anything you do will fail in some form or another: then you can toss out that annoying fear of failure and just focus on failing better, failing the way you want to. And once you realize that you’ll never “arrive”–that really no one will–you can stop freaking out about not being “there” yet and just immerse yourself in the journey: the plies, the tendus, the sweat, the studio full of warm stinky bodies, the music, the mistakes, the tiny adjustments, the joy of movement, and that glorious daily grind.